I took a risk and got this pattern hoping I could make it what I want, but not being sure. Well for me, its safe to say the risk has paid off. 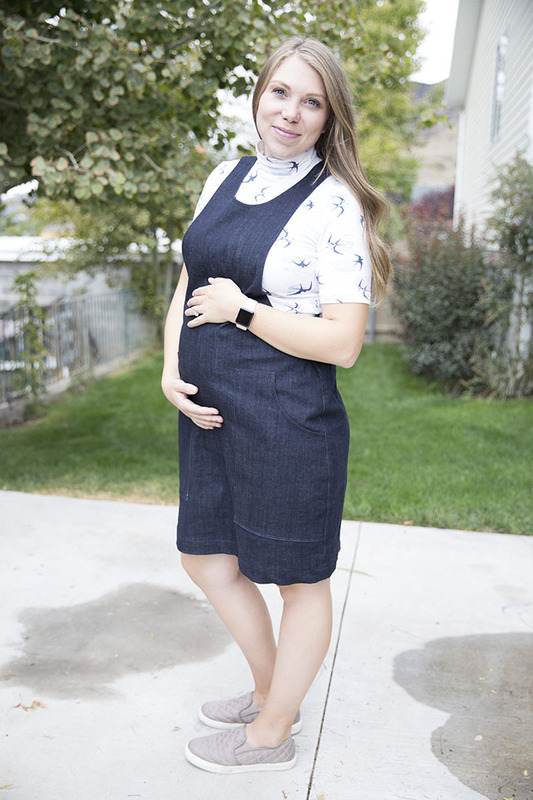 The York Pinafore by Helen's Closet is a cocoon shaped, simple pinafore with large round patch pockets or a kangaroo pocket. 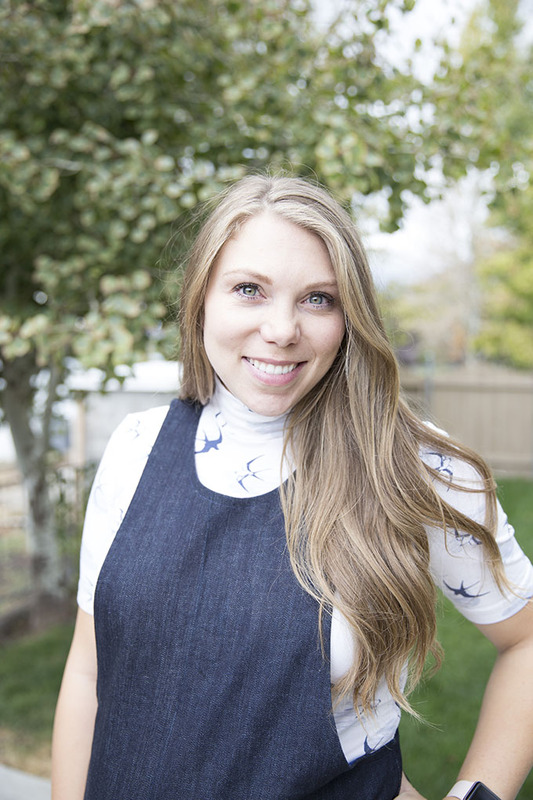 It was a risk for me because I didn't love the pockets or the cocoon shape, but I loved the simple layering idea that could be so cute in any season just by changing the fabric. This is my third. 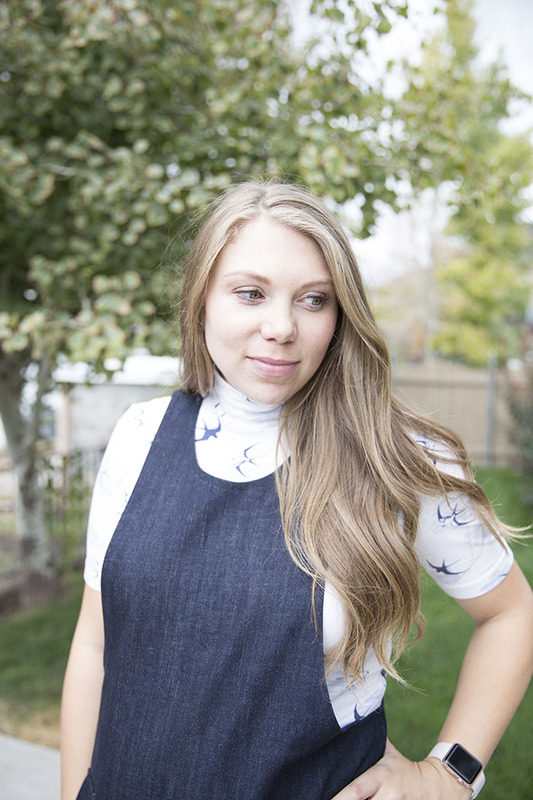 I've made a bleached chambray one that I blogged about here, a cotton linen one I shared on istagram here, and now this one in 12 oz denim slightly stretch denim from Indie Sew. I've made so many because I found simple changes that have made this pattern totally prefect for me. I'm a pear shape, and if you search the internet or fashion gurus for what pears "should wear" I do basically the opposite. They say fit and flare, gathered waists, a-line, defined waist, etc. But I actually prefer straight fit things to minimize the appearance of the curve of my hips. This pattern has a large curve through the whole side seam and tapers in at the knee to give it that cocoon shape. While this fits my shape quite perfectly, it also shows off that shape, which I don't like to accentuate. The curve of the pockets on the hips also does the opposite of what I want. I like angled patch pockets to break up that curve. So to eliminate the cocoon shape and get a straighter fit, I simply straightened out the side seam by not grading out to the proper size for my hips. The size chart put me at a large graded to extra large for the hips. I made my first one like that and then figured how much to bring in the side seams. Once it got fitting right I compared it to the original pattern and it was just the straight large size. So that is the same thing I've done for all three I have made now. 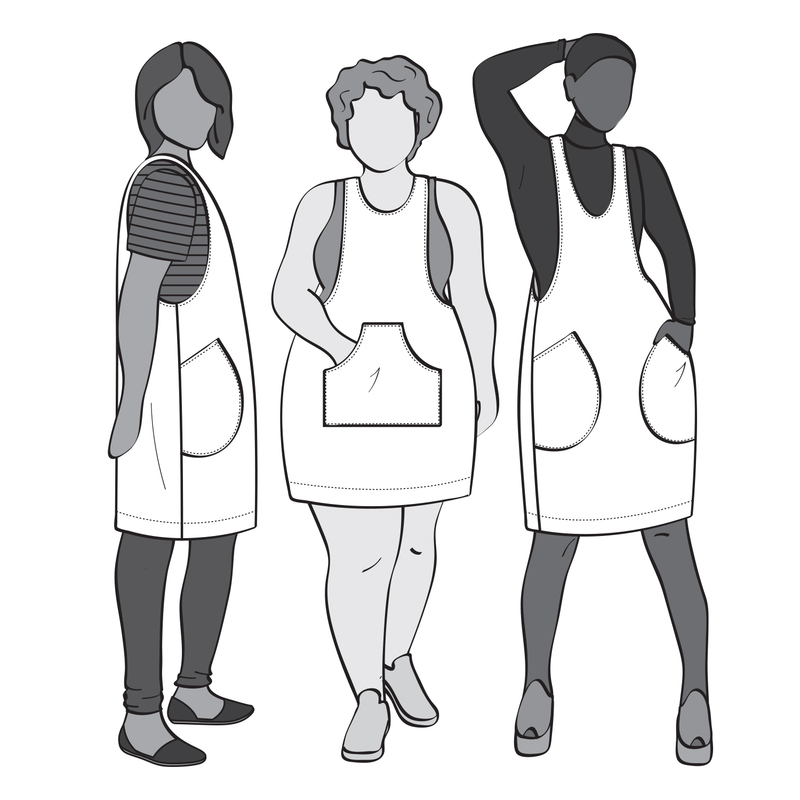 I then also drafted (I use that term loosely because I just drew out the shape of pocket I wanted and made it sort of similar in size to the one included in the pattern) and used them instead of the pocket pieces included. I just finished those curve edges of the pocket in bias tape, did a double line of topstitching around the pockets, and viola! 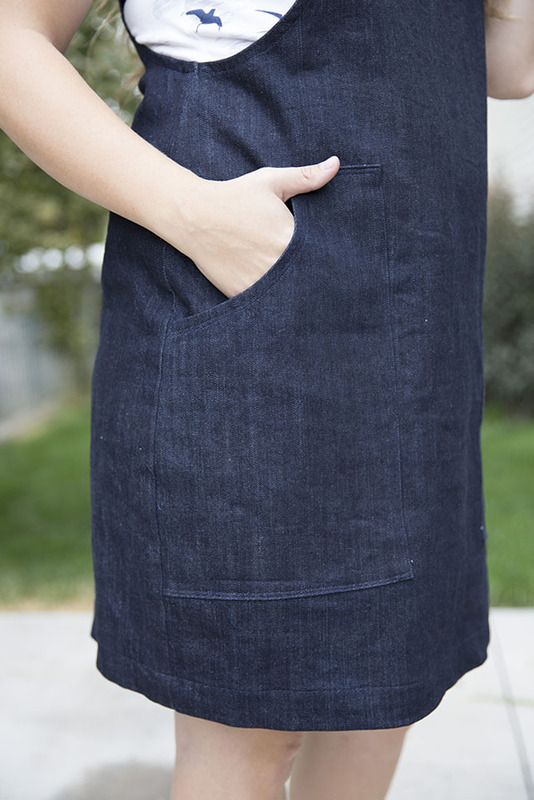 A thick denim pinafore for fall with large angled patch pockets. Also without any other adjustments it fits my bump! Granted it won't work forever but its going strong at 24 weeks. I am super pleased with my huge angled patch pockets. They hold everything, are nice and deep, and the angles are exactly the look I was going for. 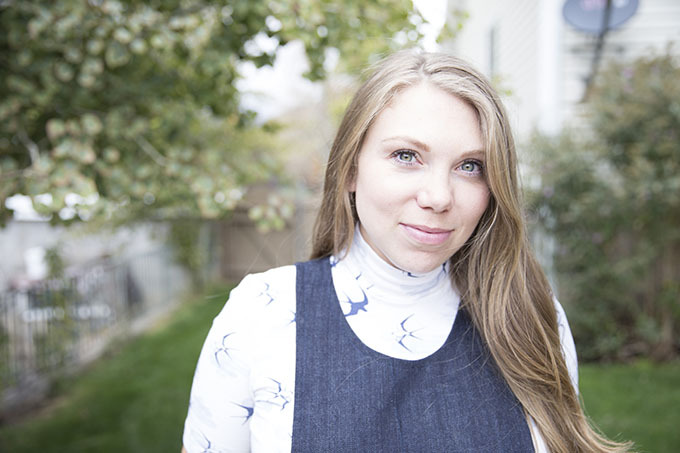 I love having a thick denim York for fall, its so cute layered with a cardigan and tights, and I think it will work well in summer too, so yay for versatility! Since we're in full on Autumn here, I paired this one with a True Bias Nikko top. I shortened the long sleeve (it comes with sleeveless or long sleeve options) to right above the elbow and did a maternity mod on it - that obviously you can't see. But its super simple - just add 4 inches at the lengthen/shorten line on the front piece only. Then gather the sides of the front until they are the same length as the back piece. Then sew together like normal. The Nikko is the perfect piece to go under this but I've seen people layer them with looser woven tops and its super cute, too. 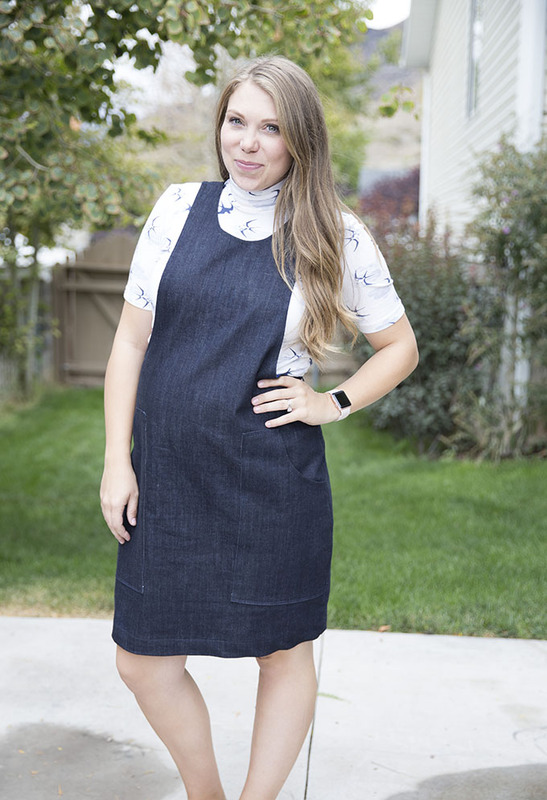 Are you into the pinafore trend or is too elementary school for you? I thought I couldn't get on board but I am super happy I did. Now I wonder if I'll ever be aboard the jumpsuit trend...?